Fill out the form below and press "submit inquery" button to get started. Long lasting, low maintenance, and a variety of colors and styles. Vinyl cladding is the most popular choice in Chicago for exterior cladding. The look a "Hardie" home is unmistakable. Straight lines, vibrant colors, and deep texture. Hardiboard is the best looking, most durable product. A beautiful new exterior is only a click away. Get a free consultation and price quote on new siding for your home today! Or for faster service give us a call, we are here to help. Serving all of Chicago and Suburbs. Toll Free (888) 356-9020. Innovative Home Concepts is the siding replacement experts in Chicago. Replacement siding for your home is like new clothes for your body. Both come in a variety of materials, designs, and styles. And just like clothing, Hardie Board and vinyl can be accessorized to make your home more attractive. But also like clothes, a bad installation that isn't right for your home can acually decrease the curb appeal of your home. So how do you decide on what product is right for your home? Durability. The durability of the material used to side your home is a key factor in its maintenance and cost. Less durable products may need to be repaired often and sometimes even completely replaced. Natural wood products can rot, crack, or decay. Other painted products may fade over time. And still other materials may be more or less suseptible to hail, wind, and other weather events. Appearance & Architectural Styling. Obviously very important to the curb appeal of your home. Appearance and style are very important to consider when choosing a new fascade. The styles, colors, and materials you choose should enrich the look of your home, not just protect it from the elements. Keep in mind that new facing, out of all home improvement projects, will change the exterior look of your home. Cost. Exterior cladding prices vary drastically depending on the type of materials you are considering and depend on two factors, material costs and labor costs. For example, fiber cement siding and LP smartside are more difficult to install and have a higher material cost, but can last for 50 years or more. Because of this, it may actually be less expensive over the life span of the home to install a more durable product. Maintenance. Wood products require sealing, staining, or painting at regularly, while vinyl siding, cement board, & metal require considerably less maintenance. No matter the product you choose, be sure to follow the recommended maintenance. Installation Difficulty. The installation of different sidings materials vary from relatively quick to very difficult and labor intensive. Depending on your completion time frame this must be factored into your decision. Future Repair Issues. Something that is not often factored in when starting a new siding project, cost of repair in case of damage should be considered especially if you live in an area with extreme weather. All house covering materials have different installation methods, some can be fixed easily, while others can not be repaired and can only be completely replaced. Vinyl is the most common siding material used on Chicago homes. It provides an appealing look at a relatively low cost with virtually no maintenance. Today, there are as many colors as you can imagine to choose from and the color goes all the way through the material, making scratching a concern of the past. Vinyl is also dent resistant and ply-able unlike metal sidings. There are also multiple styles including different widths, shingles, shakes, vertical, and specialty options. It is also easier and relatively quick to install this product, making it one of the most economical siding choices available. When buying vinyl, you should always compare the thickness of the panels. The thicker the panel the more durable the covering is and the longer it will last. The two largest and most reliable manufacturers of these products are Mastic and Royal Building Products. Vinyl is the most popular choice for homeowners and builders alike because it is long lasting, inexpensive, and virtually maintenance-free. 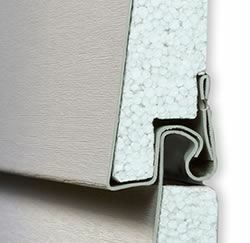 With energy conservation on the everyone's mind, many manufacturers have introduced products that incorporate a vinyl lap with an insulated backer board. With these products you get the best of two worlds, the durability and low maintenance of vinyl combined with a thermal foam insulation. In some cases the insulation found in these products can increase the insulation value of your exterior walls by as much as 30%. Also the molded foam insulation inlay makes your outer facade stronger by adding support to the vinyl panel. It will also make your home noticeably quieter from outside noise. This variety of house covering may cost a little more than regular uninsulated siding but the added value in terms of comfort and energy savings is well worth it, especially when considering the harsh weather in Chicago. Insulated Vinyl Siding will become the standard siding choice of homeowners in the years to come. A popular product homeowners are choosing is James Hardie. It has the look of wood but is pest and bird resistant, has lower maintenance, and will last longer. It can be used alone or in conjunction with brick or stone for a beautiful looking exterior that also costs less than a solid brick or stone home. It will cost you a little more than vinyl siding, and it will have to be painted. Fiber-cement facing (made of cement, sand, and cellulose fiber) looks like wood, but it's more durable and less expensive. A fairly new addition to the world of exterior cladding. Cellular PVC gives you the best of all worlds. It is durable and attractive like fiber cement siding without the issues with visible seams and strict installation precautions. It also never needs to be painted and can be easily cleaned like vinyl products without the issues of warping when its hot and cracking when its cold. Cellular PVC siding has been installed for many years on the east coast because of it durability, traditional look, and ability to with stand moisture. In the Chicago siding market it is a relative newbie. But watch out, when homeowners see the benefits of this product, its popularity is going to skyrocket. Brick is a product that has stood the test of time. In fact, many brick homes are still standing after hundreds of years. Actual brick is fired clay and comes in a range of colors from red to a variety of earth tones and gives the exterior of your home a rich, traditional look. Another nice benefit of brick is you won’t have to worry about repairs for at least 20 years from installation. On the bad side, the price of brick is higher then other exterior options, although the longevity of the product still makes it an attractive choice. Brick is also difficult to install in a retrofit remodeling situation. When brick is installed on a new home the foundation of the home is poured with a brick ledge to the support the weight of the product. In a retrofit application iron brick ledges can be attracted but this adds to the cost of the installation both in labor and materials and it may be difficult to find a mason to install brick in this fashion. Retrofit full brick installed on a wall with windows may also result in the necessity to replace said windows due to the thickness of the brick compared to how far the windows protrudes from the wall. If the cost of brick is too much, there are other options on the market today. Lightweight aggregates, cement, and pigments are cast to imitate brick or stone or a full brick is face cut to produce a thin brick that can be installed on a wall. Generally because of the extra processes involved with the production and installation of this product the cost is about the same as full brick. But because this product is lighter than full brick and is thin enough so windows and doors don't need to be replaced, it is great for remodeling and retrofit situations. On a wall, it is difficult to tell the difference between thin brick and full brick. Wood siding has been used for a long time. The natural look of this facing system is appealing to many homeowners who seek a traditional look to the outside of their homes. Types of wood covering include clapboard, plywood, rectangular plank, cedar and wood plank. Real wood is the least-used product today simply because it doesn't hold up well under typical Chicago harsh weather conditions and is also at the mercy of outdoor critters such as insects and other animals who are attracted to it. Wood needs consistent maintenance in the form of painting, staining, and caulking. It has declined in popularity as the cost of lumber has increased and demand that homeowners have for lower maintenance materials has increased. Several styles to choose from, clapboard, plywood, plank to name a few. Flammable, may need fire retardant finish applied. Prone to insects and animals that are attracted to wood. Needs to be painted, stained, or sealed regularly, high maintenance. Composite materials are man made products that are manufactured from various combinations of wood fibers, fillers, binders and glue. These materials are then heated and compressed into composite wood products. Composite claddings exhibit the beauty and authentic look of real wood while offering many advantages over traditional wood trim and siding materials. For one, composite materials are knot free which makes the material stronger and without the flaws that wood knots will create. And unlike traditional wood, composite siding products resist cupping, warping and cracking. They are factory pre-primed and in most cases can be pre-painted directly from the manufacturer, delivering optimal adhesion and consistent application. Composite materials also use a manufacturing process that helps protect against termite damage and fungal decay. We only mention aluminum here because it's actually still available. Vinyl has pretty much completely replaced aluminum as the economical exterior covering of choice. Aluminum systems gained popularity in the 1950's and was the cladding of choice up until the mid-80's when vinyl products gained a foot hold in the market. Aluminum was touted as one of the first maintenance free exterior products because it comes pre-finished and doesn't need painting. One downside of aluminum panels is it dents. Hail, tree limbs, balls, etc can make dents and dings in aluminum. And because older styles and colors are not available anymore, homeowners with damage will need to live with the damages or replace the whole wall. Another issue with aluminum siding is it needs to be cleaned frequently because the painted surface tends to chalk. Many manufacturers have stopped producing aluminum finish systems altogether but you can still find it in limited colors and very limited style choices. If you have aluminum siding on your home and think you may have hail damage, please give us a call. Innovative has an entire division dedicated to insurance restoration work and would love to help you with your hail damage insurance claim. Let us do an aluminum siding hail damage claim inspection today! Call Today for a Free Quote on a Facelift for Your Home from the best siding Chicago contractor, bar none.